The race to college actually begins in middle school. Young students and their parents should start to plan ahead in the earliest years. While we at Chicago Academic never recommend adding stress to young students, or aggressively stretching them past their natural strengths, we do believe that students should maximize their abilities to best position themselves down the road. From high school honors and AP to middle school foreign language and high school counselors, a 4.0 and/or 5.0 high school GPA scale means more than just earning grades and working hard. Parents and students can benefit greatly from knowing about a few ways to greatly maximize high school and college admissions Grade Point Averages. Most middle schools offer foreign language classes as electives. Taking two years of language in middle school can count for at least one year of high school credit and it will eliminate one more 4 point graded course. Honors and AP classes usually academically weigh students on a 5 point scale instead of a 4 point scale. An A can earn a student a 5.0, a B a 4.0, and a C a 3.0. These courses give students a chance to push their overall Grade Point Average above a 4.0. Taking the most advanced courses in middle school will allow students to enroll in Honors and AP classes in high school. If a middle school, for example, offers geometry as its highest level of mathematics, students should attempt to take geometry before they graduate from middle school. Many high schools give middle schools competency tests to administer to students to determine which high school classes students should be placed in. Students should take such tests seriously so they can be placed in the most advanced courses possible. Elective classes that do not allow a student to earn a 5.0 will bring down a student's overall GPA, even if the student earns all A's. Replacing as many of these courses with academic classes weighted on a 5 point scale would be ideal. 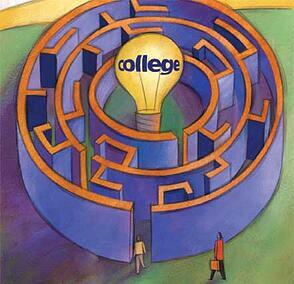 Many colleges and universities only focus on a student's middle two years, sophomore and junior year. The colleges will recalculate a student's admission GPA based on the classes taken during this time period. Taking as many 5 point courses during the middle two years of high school, and taking as many 4 point courses during the first and last year of high school, can improve a student's college admission GPA. These 4 point courses might include P.E., band, computer graphics, foreign language, art, and wood shop. These are just some quick tips to help middle school parents and students begin planning for the college admission gauntlet.